With a large, active membership we can have more influence on key decision makers in promoting the interests of the Paihia area business community. Becoming a member of Business Paihia for the very reasonable fee per year of $160 (inclusive of gst), will be of great benefit to you in your business. If you are a first time member and join midway through the year we only invoice you for the months remaining in the year. 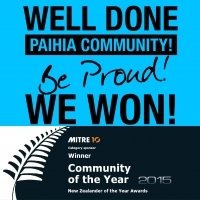 Business Paihia will send out a tax invoice.